Oh this one was so yummy! I have been using recipes from Everyday Food: Great Food Fast - a wonderful cookbook from Martha Stewart's minions. I say that because Martha does not write these books, her people do. I still love her, but I have to be realistic about these things. This recipe is from the fall section (love cookbooks arranged by season!) and it was really easy to make. RecipeGirl also raves about this recipe and she posted it on her site. I had some leftover slices of pineapple that I did not roast along with the pork, and those slices ended up in this bento. Besides the slices of pork and pineapple, there's a small onigiri rice ball that used up the rice we had with the dish, some cilantro sprigs (which are super tasty with pineapple), baby carrots, and fried padron peppers from Crescent Moon Farms. And I wanted to take a second to introduce my brand new blog! My buddy CocoCarina and I started this hilariously named blog to review restaurants. 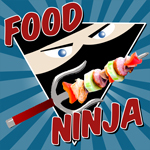 We have one review under our belts, and will be scoping out a sushi place in the near future. If you plan on dining in the North Bay, be sure to give us suggestions for places to try, and check out our reviews before you dine. Check out Two Girls, One Restaurant here! Isn't there a cheese factory somewhere "up north" where you can get picnic stuff and eat on the grounds? I heard it was a good choice for families. I'll be checking for reasons to head on up to eat! Congrats on the new blog! 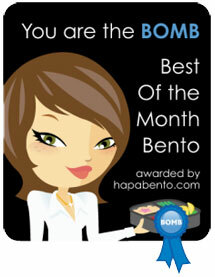 Bento is always so neatly arranged, wonderful! Thank you Sysyl! I always try to keep 5 colors in mind when I make bento. Thanks sheri! I think the place you are referring to is Marin French Cheese Factory, who make the Rouge et Noir breakfast cheese, and yummy brie? I have seen their picnic spot, but never stopped there. It looks awesome! Right on Mrs. P! I was thinking about Hawai'i when I picked out my pineapple at the store, and sad that I didn't have access to the amazing produce you have. Gotta make it back for another visit soon! Aloha! 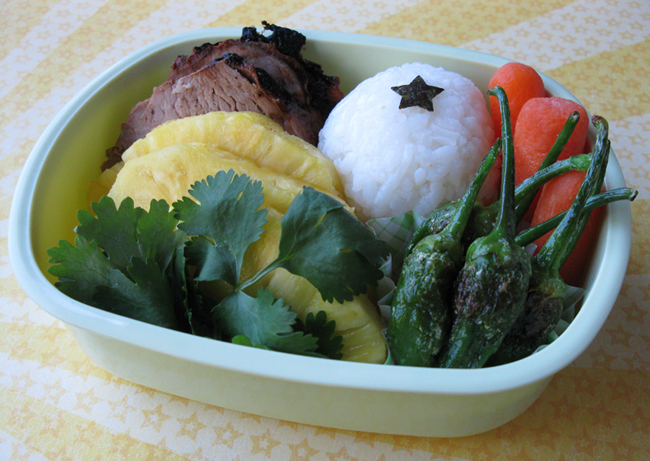 Nice bento, as always...it looks so good! Congrats for the new blog! The fried padron peppers really catches my eyes. Are they delicious? Looks interesting! Hallo Ty! Danke sehr. :) Ich gratuliere beim Blog Awards! Hi Kids Dream Work! Padron peppers are great! They are similar to shishito peppers. About one in 5 or so may be hot, but mostly they just have really good flavor. I heat them in olive oil until they are a little browned, then toss them with salt. Soooo tasty!